New Delhi: Production of the kharif (monsoon) crops this year is likely to be lower than last year, the agriculture ministry said in its first advance estimates, with the only exception being sugarcane. 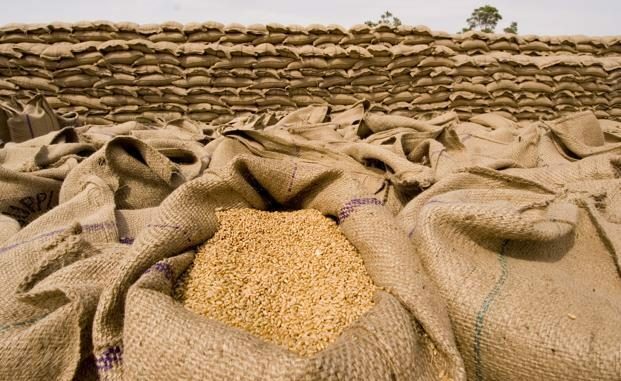 Production of foodgrains such as rice, pulses and coarse cereals is likely at 134.7 million tonnes in 2017-18, about 2.8% below last year’s record crop of 138.5 million tonnes, ministry estimates showed. Production of oilseeds—on which India is heavily import-dependent—is likely to fall by 7.7%, from 22.4 million tonnes in 2016-17 to 20.68 million tonnes in 2017-18. For cotton, despite 19% higher sowing year-on-year by farmers (who reduced area under pulses), production is estimated to fall from 33 million bales (one bale equals 170kg) last year to 32.3 million tonnes in 2017-18 due to lower productivity, the ministry said. The lower summer crop of 2017-18 compared to the record harvest last year is likely due to the uneven spread of the June to September south-west monsoon, which waters over half of India’s crop area lacking assured irrigation. So far, the monsoon has seen a deficit of just 5% compared to the 50-year average, but data from the India Meteorological Department showed that till Sunday, about 212 of the 630 districts in India from where data is received daily, have seen deficit rains of at least 20% compared to normal, while 100 districts have seen excess rains of 20% or more compared to normal. Patchy rains in parts of India were also accompanied by floods leading to loss of lives and crops in Gujarat, Assam, West Bengal, Bihar and Rajasthan. A lower summer crop in India means agriculture growth may slide from the high of 4.9% recorded in 2016-17 (following consecutive years of drought in 2014 and 2015) unless compensated by a higher winter (rabi) harvest and higher growth in non-crop sectors like forestry, fisheries and livestock. “With a negative growth in kharif output, I would lower my estimates of 2.5% growth in agriculture sector; at best, we are looking at a four-year average growth of about 2% (2014-15 to 2017-18) under the Narendra Modi government,” said Ashok Gulati, agriculture chair professor at the Delhi-based Indian Council for Research on International Economic Relations. A ministry statement said production of most crops, although lower year-on-year, is higher than the five-year average (2011-12 to 2015-16). Estimates by the ministry showed that production of kharif pulses, mostly grown under rain-fed conditions, is likely to fall 7.5%, from 9.4 million tonnes in 2016-17 to 8.7 million tonnes in 2017-18. Among different oilseeds, production of soybeans is set for the sharpest dip—by an estimated 11.5% year-on-year. The only kharif crop to buck the trend of lower production is sugarcane, which is estimated at 338 million tonnes in 2017-18, about 10% more than the previous year.